Lerici Lérze in "Lingua ligure" La Spezia dialect is Liguria’s hidden gem: a very lovely town located by the sea, in the province of La Spezia. 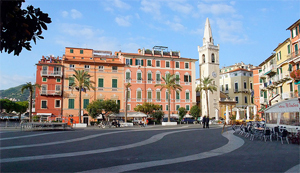 Together with Porto Venere and La Spezia, it is one of the three municipalities which overlook the Gulf of the Poets. Lerici lies in the centre of a small natural inlet, and it’s dominated by a promontory where the imposing castle stands, today turned into a museum. As regards the town’s history, its origins date back to the Etruscan period, when probably their first village was built. At that time the particular position of Lerici make it a natural harbour, firstly for the Ligurian populations, then for the Romans. Lerici preserves a stunning Castle which remains intact and rises up on the top of the rocky promontory which closes the bay in the south side of Lerici. It was built in 1552 and through the centuries its structure underwent several changes due to the alternation of different dominations: the Republic of Pisa and the Republic of Genoa. It was just around 1555 when the Castle of Lerici assumed the current conformation. Now the castle hosts the Museo Geopaleontologico in order to keep our culture intact. The Museum finds its origins from the discovery, in the territory around Lerici, of footprints belonging to dinosaurs and other reptiles, which date back about to 220 millions years ago, thanks to Ilario Sirigu, an unpaid scholar. From here it is possible to make use of a ferries service which links the town of Lerici with La Spezia, Porto Venere, the towns of Cinque Terre, Levanto, Bonassola, Deiva Marina, Moneglia and Portofino.